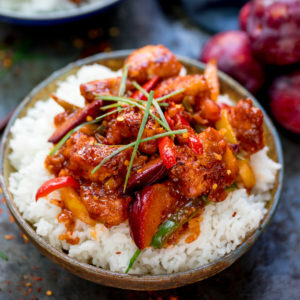 This Chinese Plum Chicken Stir Fry is a spicy chicken dinner that makes a great takeout alternative! 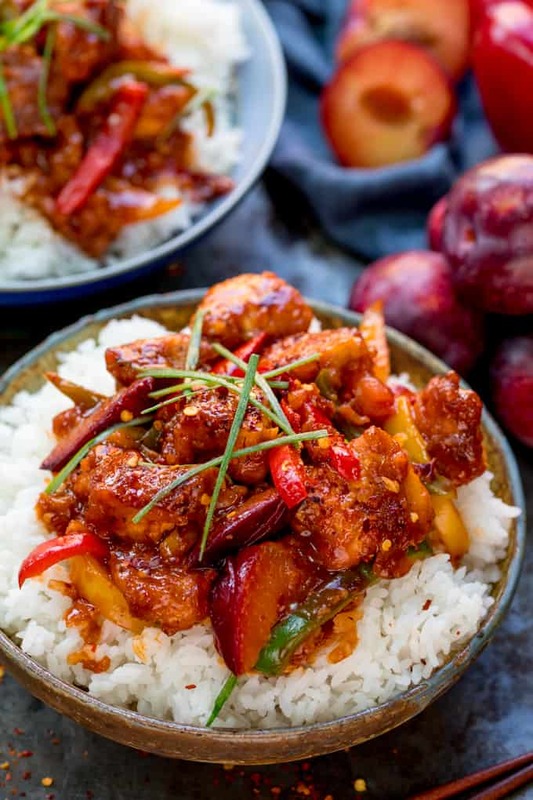 My Crispy Chinese Plum Chicken with Sticky Chilli Sauce is super-quick to make (20 minutes!). Also, check out my trick to save on the washing up! If you’re looking for a sweet and sour, spicy sauce for chicken, I’ve got just the thing! This was going to be crispy pineapple chicken – until I started cooking and realised part-way through that I had no pineapple! We’ve ALWAYS got tinned pineapple in, so I’m thinking the kids have been raiding my cupboards for sneaky snacks. I guess I can cope with that – so long as they don’t find my chocolate supply! So I made a last minute change and went for Crispy Chinese Plum Chicken Stir Fry instead. I had some pineapple juice in the fridge, so that still went in, along with lots of other store cupboard favourites to produce an addictively delicious, sweet-and-slightly-spicy sauce. The chicken is perfectly crispy – with a cornflour/seasoned-flour/egg coating. I also successfully experimented with saving on the washing up for this 3-stage coating. That’s it – I’m done with those three bowls for each of the coatings. If you get the quantities right, the coating can all be done in one bowl (it’s the little things that make me happy :-)). This is a recipe I first came up made over a year ago. When I originally photographed it, I put the food in cute little Chinese takeaway boxes (I’ve kept one of those photos below). I think Chris and I had been watching too much Big Bang Theory (yeah, we’re a little late getting started with that series). They always seem to be eating Chinese food out of those little boxes, and we both decided that we wanted some! Takeaway boxes in the UK (at least in my area) are simple plastic or foil boxes, so I guess the little cardboard boxes are an American thing. Anyway, I found some online and bought them! One of those things you REALLY don’t need, but you want anyway! 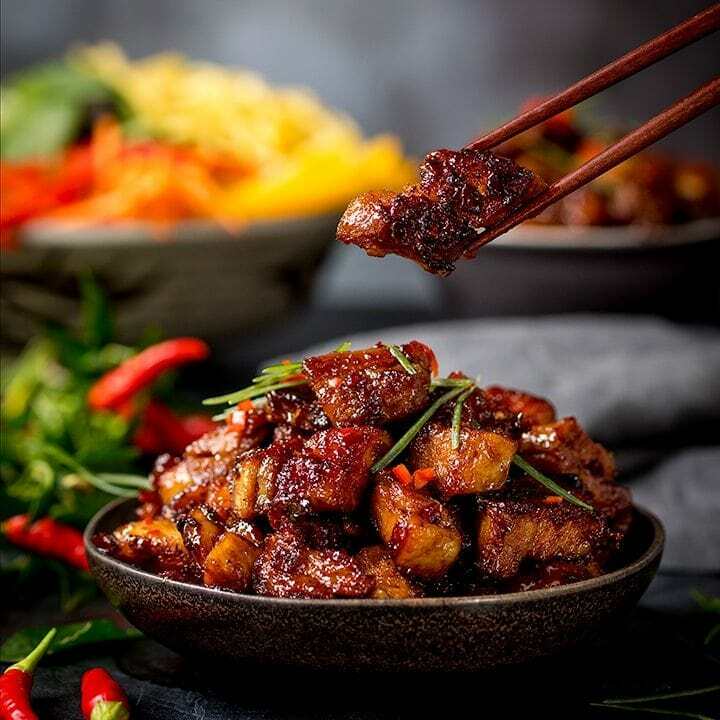 We have used them in a number of our Asian recipes like Crispy Sesame Chicken, Crispy Chilli Beef, Crispy Chilli Chicken, Quick Chicken Stir Fry or my Spicy Ginger Beef stir fry. And I love them! I’d like to say that they help with portion control – but I usually end up going back for seconds. However they are useful on saving on washing up. That never gets old. Can I make it gluten free? Yes, replace the soy sauce with tamari and the flour with gluten free flour blend. Sweet chilli sauce is often gluten free, but best to check (I use Linghams sweet chilli sauce). Rice vinegar and tomato puree are generally gluten free, but it’s best to check. How can I make my chicken extra crispy? The absolute best way to get extra crispy chicken is to use more oil to fry the chicken, and make the veggies and sauce in a separate pan. Remove the cooked chicken from the pan with a slotted spoon, drain on kitchen paper and dish out onto the rice. Spoon the veggies and sauce over the top. If you cook the chicken in the sauce, like I have (still delicious and saves on the washing up), the chicken will be less crispy the longer it’s in the sauce. So add your sauce ingredients just a few minutes before you’re ready to serve. You can prepare the sauce ahead, by mixing the sauce ingredients together and covering (store at room temperature or in the fridge). The chicken can be covered in the coating ahead of time (a few hours ahead maximum). The coating will be sticky, but it will crisp up when fried. Replace the sweet chilli sauce with ketchup and leave out the chilli flakes. The kids LOVE it! Yes, you can cool, cover and freeze, then defrost before reheating thoroughly (heat in the microwave or covered in the oven or in a wok/frying pan). However, the chicken won’t be crispy, and the vegetables will soften. It’s still tasty for a quick meal though. A spicy chicken dinner that makes a great takeout alternative! 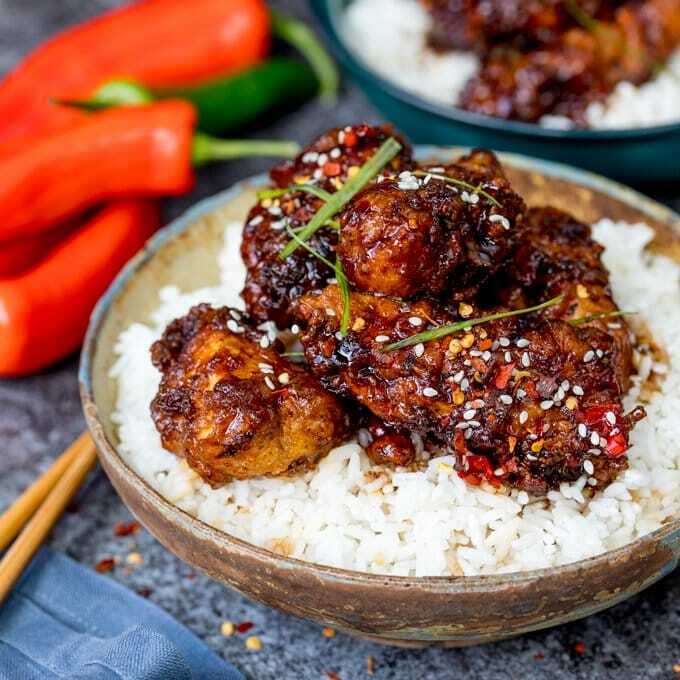 My Crispy Chinese Plum Chicken with Sticky Chilli Sauce is super-quick to make (20 minutes!). Also, check out my trick to save on the washing up! Heat the oil in a wok or large frying pan until very hot. Whilst the oil is heating, place chicken in a bowl and sprinkle on the cornflour. 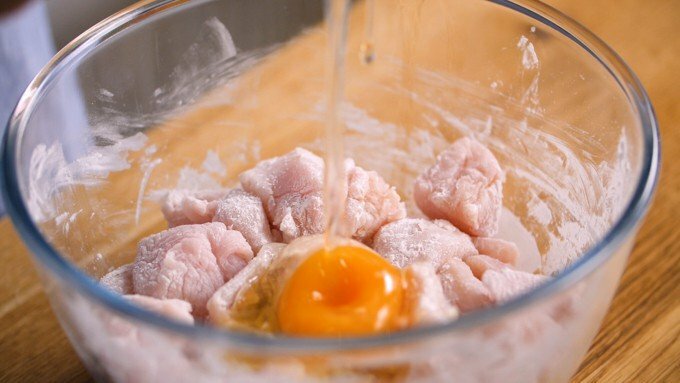 Mix together with a fork or your hands until the chicken is coated. Now break the egg into the bowl with the chicken, and use a fork to mix everything together thoroughly. There should be no egg pooling at the bottom of the bowl. If there is, discard it. Next, sprinkle on the flour, followed by salt, pepper, garlic salt and paprika. Mix everything together with your hands. The chicken should be well-coated, but will also be sticky. Add the chicken to the wok and cook on a high heat for 6-7 minutes, turning two or three times during cooking, until well browned. You may need to cook in two batches (I find I can do it in one batch so long as there are no more than 3 chicken breasts). Once golden brown, add the plum slices, peppers and garlic. 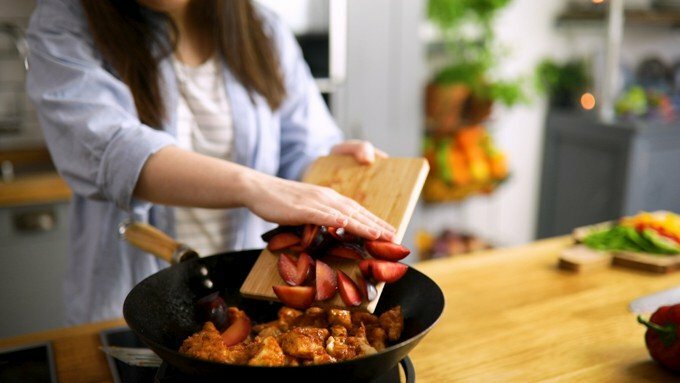 Cook, with the chicken for 2 minutes, stirring often, until the plum starts to soften. Now add all of the sauce ingredients to the wok, stir and bubble on a high heat until the sauce reduces by about a third (should take 2-3 minutes). Turn off the heat and divide between four bowls. Serve with boiled rice and top with spring onions and chilli flakes. Nutritional Information is per serving, WITHOUT the serving suggestion of boiled rice. 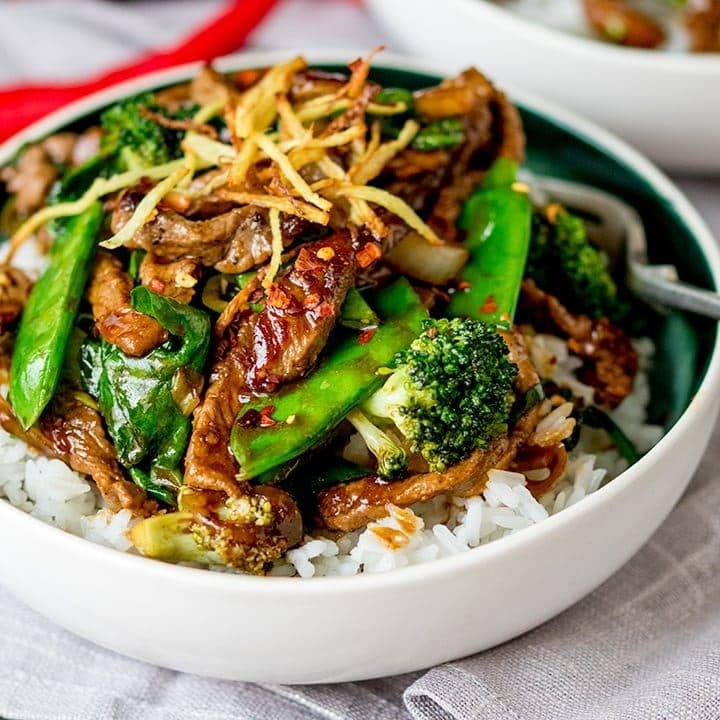 All your Chinese chicken stir fry dishes have been amazing. I even use nectarines when I can’t find decent plums. I make one every 2 weeks, loved by all the family. 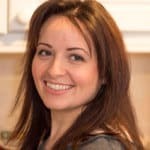 Thankyou for sharing your recipes with me. 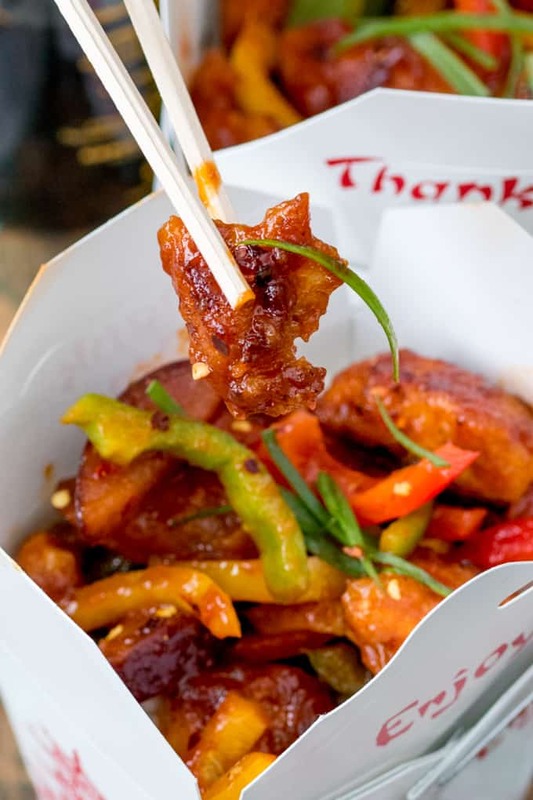 All your Chinese chicken stir fry dishes have been amazing. I make one every 2 weeks, loved by all the family. Thankyou for sharing your recipes with me. 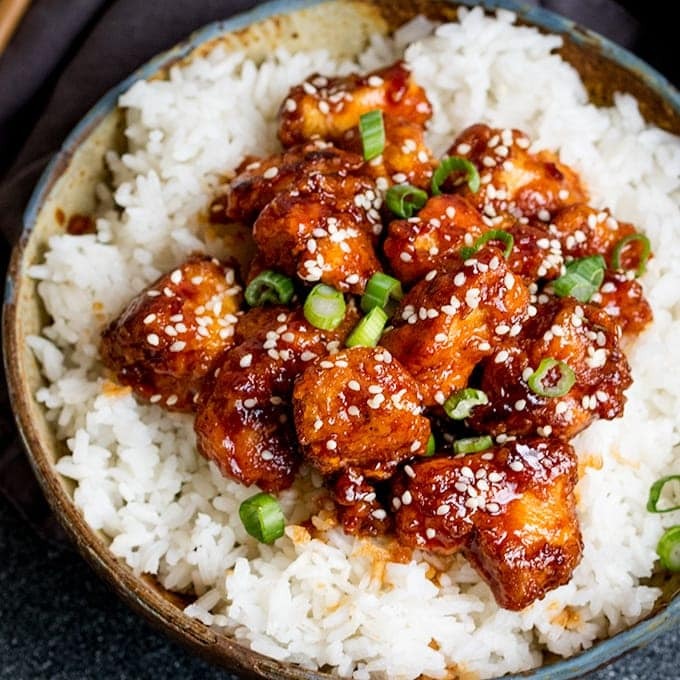 I tried this recipe and it is delicious and the sauce is yummy but i am having a problem with the flour coating coming off in the pan and i then get lumps of flour in the sauce. Not a good thing. Please advise why this happens. I only used 2 chicken breasts chopped. Thanks so much for your delicious recipes. I love them. Hi Sapna, are you frying the coated chicken in the oil first? That should ensure the flour is fully cooked and crispy before the rest of the sauce ingredients are added. Thank you for your reply Nicky :). I was not deep frying the chicken- i was pan frying in the way i thought was in the video- one pan with the frying and addition of the sauces. Do you think i should fry separately then add to the sauce? Nicky, those take away boxes you see on The Big Bang Theory are with Chinese food. Chinese restaurants always use them; however, when you get take away food from other places they are usually in plastic containers or even cardboard-type boxes, but not like the ones in The big Bang Theory; they are always with Chinese food. I know what I’m going to be cooking up this weekend! My hubby’s in for a treat! Love how you’ve presented this in a food box. Thanks for the recipe! The recipes posted above are all enjoyable.